A tub-to-shower conversion is one of the wisest investments you can make for your bathroom at your home in the New England area. Not only will a shower increase the aesthetic appeal and functionality of your space but it will also provide you with a low threshold that makes it safer to enter-and-exit than ever before. And, when you turn to the professionals at Clear Choice Home Improvements for this investment, we can even provide you with optional grab bars and shower-seats to make your bathing experience even less stressful and dangerous. Whether you desire a new safety inducing shower or you’d prefer a shower-to-tub conversion for your bathroom, you’ll feel comfortable knowing that you’re receiving a product from industry leading manufacturer – BCI. Their non-porous acrylic products are designed to require minimal maintenance so that you can continue enjoying your investment without wasting any more time than an occasional wipe down while cleaning it. 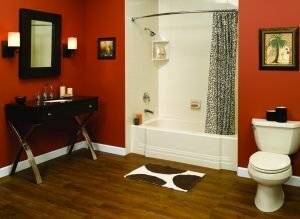 And, with a wide variety of styles and colors to choose from, your new shower or tub will perfectly complement your unique tastes and the existing appearance of your bathroom. By making the Clear Choice for your home and turning to us to complete a tub-to-shower conversion, you will be able to feel confident knowing that your investment is completed correctly the first time. Our bathroom remodeling contractors are all highly-experienced and will perform your conversion in a prompt time frame so you can begin enjoying your safer bathing environment as soon as possible. Plus, we’ll even provide you with the incredible lifetime warranty from BCI so you can rest assured your investment remains protected. To learn more about what makes our tub-to-shower conversion services stand out from the rest of the bathroom remodeling contractors in the New England area, contact Clear Choice Home Improvements today.